Who doesn't love spinnerbaits? They have the potential for catching bass shallow, deep, in heavy cover and in open water. They can be fished slow or fast and in any season. They are amazingly weedless and appeal to both largemouth and smallmouth bass. Besides all that, they're a lot of fun to fish and easy to make yourself. So what makes a spinnerbait, a lure that looks nothing like any natural prey of bass, the bass catcher it is? The sum of its parts! Each individual part that comprises a spinnerbait is essential to creating the "deception" that make bass strike this most unnatural lure. Let's break one down and see what makes these bass catchers tick. The great majority of spinnerbaits come from the manufacturer with some combination of three or four primary blade styles, Colorado spinner blade, Indiana blade, Willow Leaf and of late the Oklahoma blade. There are other "hybrid" shapes as well though they have not been enthusiastically embraced by the majority of bass fishermen. 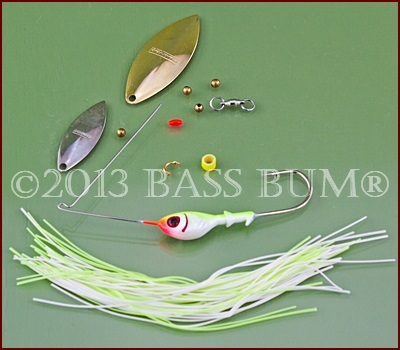 Spinnerbait blades are the source of the lure's "flash" and "vibration", which are most important features. Why? Because you must get old bucketmouth's attention if you have any hope of catching him, or her. 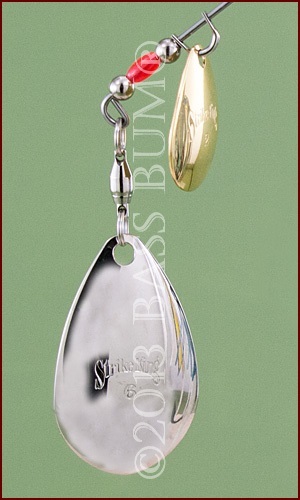 Swivels are the small devices that allow blades to spin as the lure is retrieved. A swivel is attached to the end of the spinnerbait arm and to it is attached a blade with a split ring. Swivels are either barrel or ball bearing in construction with the latter being the better of the two by far. Ball bearing swivels, at least high quality versions, allow maximum rotation while barrel swivels, if of a high grade, will provide very good if somewhat less rotation. When considering a potential spinnerbait purchase flick the blade. It should spin freely, consistently and without resistance them come to a slow, gradual stop. If not, reach for another as something is wrong with that one. These little plastic beads serve to separate the metal beads often a part of a spinnerebait anatomy. Beads are used as separators between the front and rear blades. They are made from metal (silver and gold color), glass (smooth or faceted), and plastic. The latter are sometimes rounded but other times more of a tube than a bead. I find the tube separators to be problematic in that they sometimes, though not always, have flat ends which generate more friction with clevises and other beads inhibiting rotation. 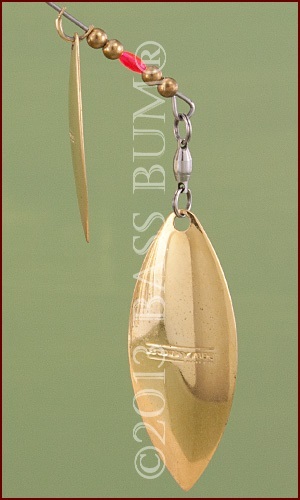 These little u-shaped devices are positioned on the wire arm of spinnerbaits to hold the front blade of a tandem setup. These are produced from (1) folded metal with flattened perforated ends, (2) spring metal, usually brass or brass coated with nickel or (3) plastic that are "quick change" in design. The wire frames of spinnerbaits are intended as the "rest" for the lead head and the shaft where sliding clevises, beads and the swivel are attached. Historically made from stainless steel they are now made of titanium as well. Much debate takes place over which is best, stainless steel or titanium. The stainless advocates feel the stainless steel is more flexible and better transmits vibration while titanium is too stiff. They think this actually absorbs and consequently diminishes vibration. Proponents of titanium feel that it is light, strong and won't bend out of shape when catching bass. In my former life I worked extensively with stainless steel and titanium. I'm aware of the significant differences between the two metals. I'm not sure these differences are such that they would cause any marked difference in a spinnerbait's performance. Seems to me merely changing blade size or shape will have far more impact on presentation than the material the wire is made from. There is a second debate over which is better, thin or thick wire. Wire that is .035 thick is the standard and used by most manufacturers. Thinner (.032) and thicker (.040) wire is available. 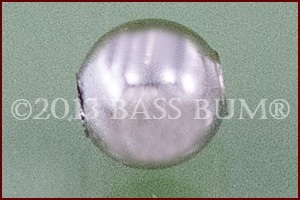 It is argued that the thinner wire allows for more vibration while the thicker wire enables a spinnerbait to plow through the thickest of cover. Most arms are what might be considered "long" measuring 2 1/4", 2 1/2" and up to 2 3/4". These position the blade over the hook correctly. Shorter arms are best for spinnerbaits fished with a "helicoptering" technique along bluffs. No rocket science here. The size and weight used by an angler is determined by the desired depth and speed they intend to fish. Heavy heads are for depth and speed. Smaller, lighter heads are for fishing shallow and slow. Determine the depth where the bass are to be found and choose your weight accordingly. A good all around weight is 3/8oz to 3/4oz though it's smart to have some lighter and heavier at hand. 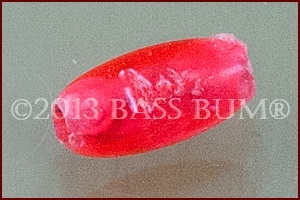 Lead bodies come in many shapes and color schemes designed more for catching we bass fishermen than the bass. So pick what catches your fancy after the weight, blade combination, skirt color and hook size are settled upon. Spinnerbait skirts give spinnerbaits more than just a "pretty face". They add bulk and flair. An active skirt that flairs and undulates serves as an "attraction" to bass. The fascination many of us anglers have with "altering" out-of-the-package skirts "just so" might possibly be just a "feel good" effort rather than something that makes a bass strike with greater commitment. 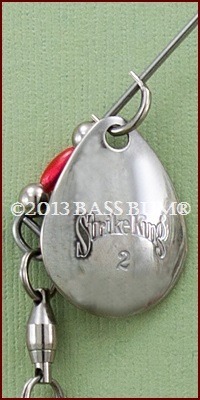 Do bass really pay much attention to whether a spinnerbait skirt is 1/4" or even 1/2" shorter or longer than another? I'm not sure. But it is smart, if you're into modifying lures, to leave the skirt long enough to completely cover (by no more than 1 to 1 1/2" in dark water and 1/2" in clear water) a primary and a trailer hook if being used. If the skirt extends much farther past the hook than these lengths you will likely experience "short strikes". The bulk of a skirt should also be given some thought. In clear water less bulk is desirable. Thinning out 10-20 strands of a spinnerbait skirt, which usually come standard with 40 or so, is an important consideration if fishing clear water. In darker water more bulk is desirable because it gives a larger profile and better generates vibrations that can be detected by bass. I have to admit. I'm one of those who fiddle with, trim and shape "store bought" skirts and do the same with those I make at home. It's just another part of the very enjoyable "fishing" part of bass fishing and catching. Hooks on spinnerbaits are generally, or at least should be, strong, wide gap and round bend in design. The addition of a "trailer' or "stinger" hook to the main hook is considered by most bass anglers to be important for increasing hook ups. As with all matters of bass fishing, there are multiple opinions about the use of trailer hooks with spinnerbaits. There are those that consider the use of a "trailer hook" to be a form of cheating which diminishes your bass fishing skills. They think the angler should change the shape, size and color of blades or trailer bait to entice stronger, more commited strikes rather than add a trailer hook. Do whatever floats your boat I say. Each of us should fish the lures and techniques that work best for us. However, Kevin Van Dam, arguably one of the best spinnerbait bass fishermen ever, always uses a trailer hook. I choose to take his lead. 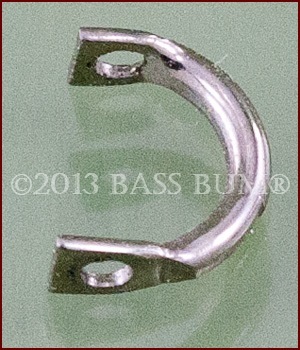 Something you may wish to try is to attach a "treble hook", dressed or undressed, as a trailer hook. Each component of a spinnerbait impacts its performance. When combined, the sum of these parts and the interaction of each on the other as well as their interaction with the water, forms a spinnerbait that has its own unique profile, flash and action. The more you know about and understand this the better you will fish them, whether you bought them off the shelf or made your own. Rods 6'6" in length and rated either medium or medium heavy and which handle lures 1/8oz to 1/4oz and 1/4 to 1oz respectively will meet the demands of fishing spinnerbaits. I use both baitcasters and spinning reels for my spinnerbait fishing. I spool them with monofilament between 12-17 pounds and always tie directly to the frame, no snaps. In clear water the use of plastic trailers with spinnerbaits is thought to be a negative, since a small, compact profile is desirable in clear conditions. This line of thought is consistent with the philosophy one should also thin out skirts so the profile is smaller in clear water. Conversely, the use of a trailer in dark water is thought to be a positive as it increases the lure's silhouette and moves more water which generates vibration.